This level has medium difficulty and you need to use good technique to complete this level. For this level you should try to play near to soda bottles or blockers to break them. 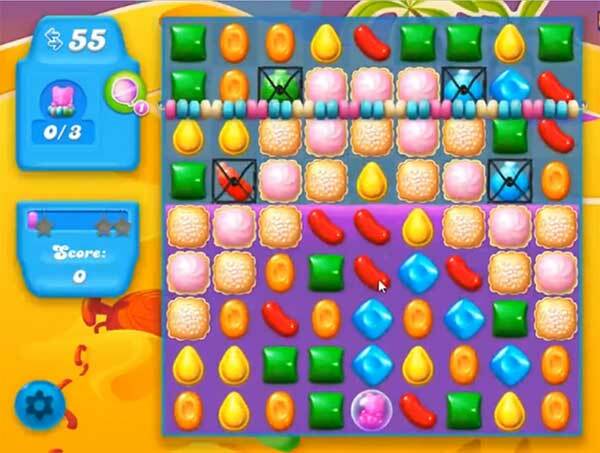 Or make special candies like colorbomb or other and combine to each other if you get the chance to break more blockers. After play near to remaining soda bottles to break them to reach the target. This level, 250, has finally finished me off. It is no longer enjoyable at all. I have been stuck on it for two weeks. It is a nice round number, so this is where I officially quit CCSS. Thank you for your tips. I finally managed to get through based on your tip: 1st level done with 39 moves left, 2nd level with 23 moves left last level with 5 moves left over. My biggest challenge is getting through all the levels WITHOUT paying for ANYTHING. I don’t care if I have to sit on a level for months. Love this game better than the first Candy Crush Game. This one is a monster!! you say to stay near bottles yet you dont do this hardly at all on the first level at least. ive noticed other tipping websites doing the same thing. been stuck on this level way too long. i was like 2nd place among friends now way too many passing me. so embarrassing. might be time to quit. I finally beat this level a few minutes ago after going at it since the beginning of this week. This is the level from [email protected]$! I hate this level and I never want to see it again…of course there are few that I never want to see ever again. For those who want to end playing this game because of this monstrous level don’t. Take a break from it. This level made me feel stupid but I did it. Don’t get too bummed out. I don’t want to stop playing this game cause of a level an believe me I was getting to that point. You are smart keep at it!!!!!! I quit the first Candy Crush because it got to be too difficult. This level is heading that way. I’m also stuck on Blossom Blast. I might delete both and play a different game. I also got ride of Pet Saga. The games are fun at first but then you make them too hard. No fun after that. Thinking goodbye King Games. Thank you, I got through this level on my 3rd try, failing on the 1st & 2nd tries due to lack of maybe 2 moves. I’d not have made it without seeing your tips! I really didn’t mind playing this level using your tips. This is ridiculous. I quit candy crush because the levels were too hard to win. Now it looks like candy crush soda is going the same way. I can get two of the bears, but not the third. I’ve read the tips, but they don’t seem to help me at all.